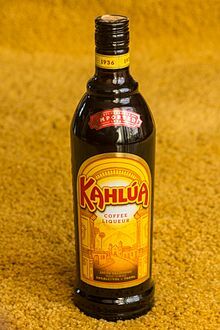 Kahlúa (Spanish pronunciation: [kaˈlu.a]) is a coffee-flavored liqueur from Mexico. The drink contains rum, sugar, vanilla bean, and arabica coffee. Pedro Domecq began producing Kahlúa in 1936. It was named Kahlúa, meaning "House of the Acolhua people" in the Veracruz Nahuatl language spoken before the Spanish Conquest. Kahlúa was Hispanicized as Ulúa, forming the name of the modern San Juan de Ulúa fortress. Since 2004, the alcohol content of Kahlúa is 20.0%; earlier versions had 26.5%. In 2002, a more expensive, high-end product called "Kahlúa Especial" became available in the United States, Canada and Australia after previously being offered only in duty-free markets. Made with arabica coffee beans grown in Veracruz, Mexico, Kahlúa Especial has an alcohol content of 36%, has a lower viscosity, and is less sweet than the regular version. Kahlúa is used to make cocktails or drink neat or on ice. Some people use it when baking desserts, and/or as a topping for ice cream, cakes, and cheesecakes. It is mixed in several ways, often with different combinations of milk, cream, coffee and cocoa. Because Kahlúa is made from coffee beans, it contains caffeine. According to the company, it contains "approximately 10 mg per 100 mL (4.85 mg in each 1.5 oz) drink" or about 25% the amount found in the same volume of coffee. Wikimedia Commons has media related to Kahlúa. This page was last edited on 12 February 2019, at 12:17 (UTC).